The DH-10 LACM was on display for the first time during last night’s rehearse for the PRC’s 60th anniversary of the nation’s founding near Tiananmen square. 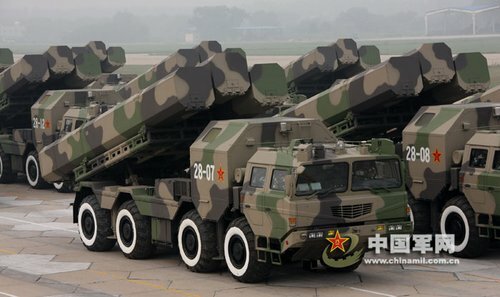 This secretive project was first reported in 2004 and according to the 2008 edition of the “Military Power of the People’s Republic of China” (here) the 2nd Artillery Corps has an estimated 50 to 250 missiles with about 20 to 30 launchers under its command. The DH-10 LACM has an estimated range of more than 1,500km and likely to be equipped with an integrated inertial navigation system/Global Positioning System, supplemented by a terrain contour mapping system and digital scene-matching terminal-homing system able to provide a circular error probable (CEP) of 10m. Together with YJ-63, they formed the PLA’s “stand-off, precision strike” package against high value targets — a capability that was inspired by the US’s success in the recent Gulf Wars.